A day at the beach without meeting up with a jellyfish normally gets counted as a good beach day. Jellyfish, marine animals without backbones (invertebrates), live in oceans around the world. We know them as the stinging ocean animals. 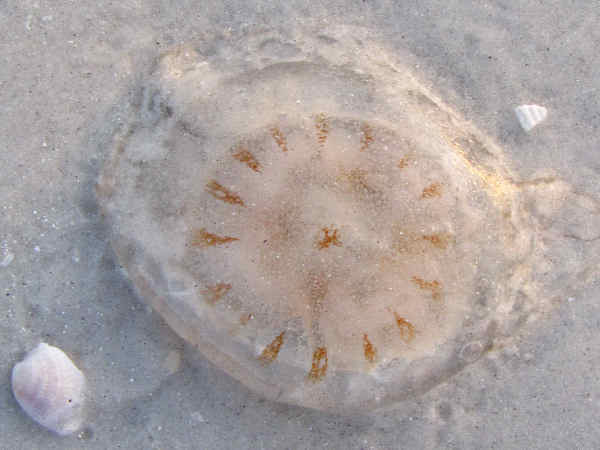 The name jellyfish refers to the animal’s jelly-like bell, or box shaped body. The accompaning tentacles suit their carnivorous diet bu paralyzing prey with toxic substances. While most jellyfish sting, not all jellyfish stings are deadly to humans. 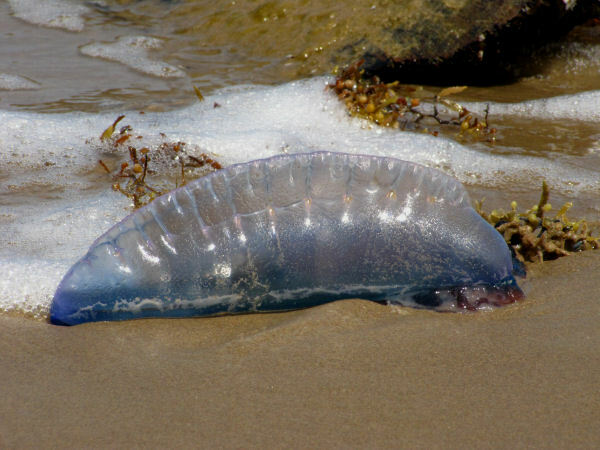 The Portuguese man-of-war (Physalia physalis), pictured above, and various box jellyfish are probably the two most dangerous jellyfish found along the coastal waters of the United States. Prevention is worth an ounce of cure, and knowing which jellyfish to avoid is the best way to prevent jellyfish stings. Other native jellyfish such as sea nettles and purple-striped jellyfish are also known to cause painful stings. The picture shows the rust colored marks of the Sea Nettle Jellyfish (Chrysaora quinquecirrha), and East Coast species. Avoiding jellyfish stings can also be as simple as checking local beach reports about areas where large numbers of jellyfish (often called blooms) have been cited. Avoiding any jellyfish that wash up on the beach also helps. With some differences between species, there seems to be evidence and consensus on oral/topical analgesics, hot water and ice packs as effective painkillers and on 30 s application of domestic vinegar (4%–6% acetic acid) to prevent further discharge of unfired nematocysts remaining on the skin. In the past decade increasing numbers of jellyfish blooms have been reported, and scientists are testing a variety of hypotheses related to their cause. One such hypothesis assumes that increases in jellyfish populations results from declining fish populations. The reasoning starts with the assumption that many jellyfish species share a similar diet with fish. As an area becomes over fished, the jellyfish move in to feed on the smaller fish and plankton still remaining. Rather, the strongest nonrandom trend indicated jellyfish populations undergo larger, worldwide oscillations with an approximate 20-y periodicity, including a rising phase during the 1990s that contributed to the perception of a global increase in jellyfish abundance. Sustained monitoring is required over the next decade to elucidate with statistical confidence whether the weak increasing linear trend in jellyfish after 1970 is an actual shift in the baseline or part of an oscillation. Sea Anemones share similar feeding habits with jellyfish, their tentacles contain a toxin that can paralyze small fish and other creatures that come into contact with it. 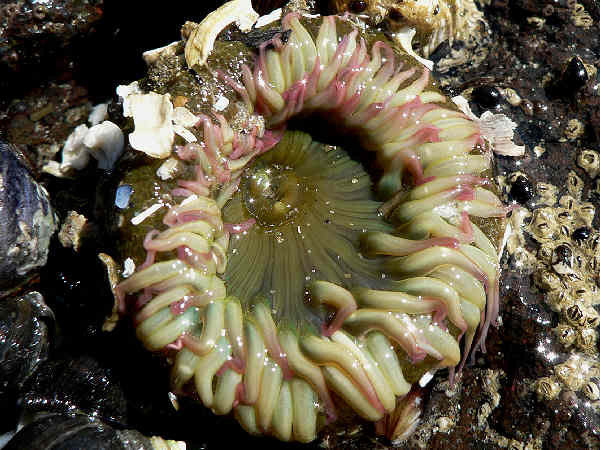 Sea anemone habitat varies. Many species around the world live along the rocks in coastal tide pools. When the tide goes out it is often easy to walk around the area in search of them. They come in a variety of colors and sizes, with approximately one thousand species documented world wide. Of those, about ten species live in harmony with fish, specifically clownfishes. Look, but don’t touch, represents a rule of thumb for anyone who crosses paths with them. Many species have stings that produce ill effects on humans.